You have just finished a training course – whether it was a part or full time, one week or one year – from the moment you pat yourself on the back, the knowledge and/or skills you received in those studies will start to decay. What can you do about it? The first thing is to understand what is going on in regards to why we do not retain all that we learn. So, we will look at the factors around skill decay to give you an understanding that this is not just a matter of forgetfulness and how to mitigate against it. 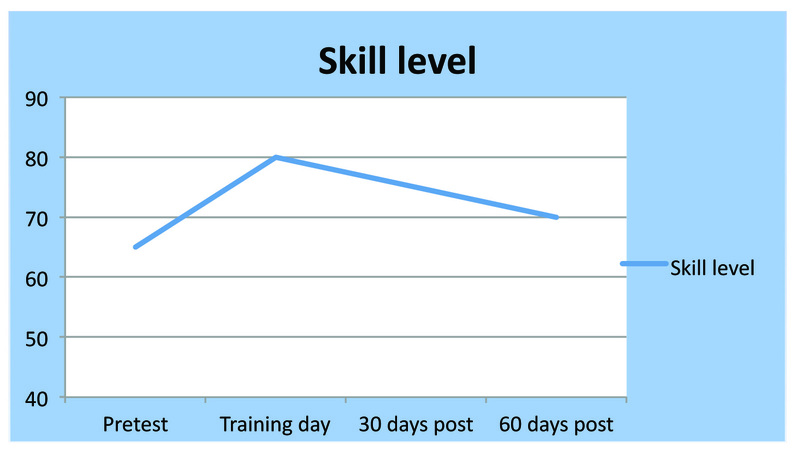 Skill decay refers to the loss or decay of trained or acquired skills (or knowledge) after a period of non-use. Skill decay is salient and problematic in situations where individuals receive initial training on knowledge and skills that they may not be required to use or exercise for extended periods of time. Reserve personnel in the military, for example, may be provided formal training only once or twice a year, when called up for active duty. Yet, it is expected that they will need only a limited amount of refresher training, if any, to reacquire any skill that has been lost and subsequently to perform their mission effectively. This is nothing new and very applicable to emergency services; in summary ‘use it or lose it’. A quick literature search throws up many examples of skill decay and we will quickly touch on one by Compton and Chien ‘Factor Relating to Knowledge Retention after Crisis Intervention Team Training of Police Offices’ 2008. Critical Intervention Teams (CIT) are used to defuse and stop the criminalisation of individuals with serious mental illness and team members attend a 40-hour course composed of lectures, visits and practical training. A survey was used to test participants going back three years and, as expected, knowledge scores decreased significantly in the months after the CIT training. Less experienced officers had a lower follow-up scores. The findings indicated that CIT officers would benefit from continuing education and that the more seasoned officers may be better candidates for CIT training, at least in terms of knowledge retention. Work done on computer-based training by Reid, Jacobsen and Katz ‘Knowledge Retention in Computer-based Training with Adult Learning’ showed the following drop off. In 60 days you are almost back to where you started. This is of particular concern when being trained in life and death situations. From the CIT example you will see that there is more to it than your individual memory. I touch on five of these factors for you to take into consideration when thinking about skill decay. This is the effect on knowledge or skill deterioration when knowledge and skills are not used or exercised for a period of time. It is very clear that time is an enemy of knowledge. As an example how many of you will relate to the loss of a language learned at secondary school if it is not used in day to day life? Over learning provides additional training beyond that required for proficiency. This appears to be one of the single most determinant factors. The emergency services have a propensity to fill up the available space. Matter experts sometime lose sight on the training outcome particularly at the lower level of training. If the outcome is to teach a student CPR, do not add in defibrillators until the base skill CPR skill is imbedded, or risk losing both. A closed loop task is one such as a pre-flight check and other fixed sequence tasks usually involving discrete responses that have a definite beginning and end. On the other hand an open loop task such as tracking and problem solving do not have a defined beginning and end. It has been found generally that closed loop tasks decay more rapidly than open loop tasks. Physical skills are those requiring activities such as muscular strength, exertion, endurances and coordination. Cognitive tasks on the other hand involve perceptual input, mental operations, problem solving and decision making. Although mental practice was effective for both cognitive and physical tasks, the effect of mental practice on retention was significantly stronger for cognitive tasks. Mental rehearsal is considered practice of knowledge and skills. These differ in two main ways that may affect retention, namely complexity and motivation. Natural tasks are usually more complex and integrated into the day to day experience of the student; natural tasks also have the participant’s genuine interest in acquiring and retaining the proficiency. Natural tasks include; instrument flying, simulated events like a lunar landing, and managing emergency service situations. Artificial tasks include problem solving, mazes, gymnastic skills such as balance. It is generally found that natural tasks retain skills and knowledge better than artificial tasks. Learned tasks that require speed and those that require accuracy are easy to measure but difficult to compare. However, NASA in looking at space-flight skills found that the ability to perform motor tasks in a specified period of time tend to deteriorate more rapidly than performance accuracy. The last point to be taken into consideration in the complex issue of knowledge and skill decay in the individual. Individuals have their own learning ability and it is generally found that higher ability individuals retain more knowledge over a period of non-use than lower ability individuals. It is also found that higher ability trainees acquire more knowledge, skills, or both in the same amount of time than the lower ability trainees. There is also some evidence that lower ability trainees forget larger portions of abstract, theoretical material than do higher ability individuals. Although there are many ways of testing the above factors, and they may give different results, the basic premise is that skills and knowledge decay over time. Many factors show that the level of decay is different depending on the training program; what was learnt and how it was learnt. Simple skills reinforcement programs will not be sufficient to set up your people to be successful in operations, safety of the public and occupational health and safety requirements within an agency. So how can you utilise and reinforce the knowledge and skill you recently acquired when you return to work. Is this the role of the individual or the organisation? Obviously there is a role for both. We would like to touch on some consideration for those returning to work after attending an intensive course or arriving at work after finally completing a six year part-time study. First of all, your colleagues did not attend the course and no matter how much you talk about it the pressures of the office will prevail and your decay starts immediately; your own work requirements that have been building up while you have been away are now intruding into the new knowledge you acquired. As soon as you return, talk to your line manager about how you can use the acquired skills. Be proactive and volunteer to use your new skill whenever possible. You are not alone, as all the people that attended the course with you will be going through the same issues. Form a professional group designed to maintain your skills. The benefits of reinforcement and support are well worth the effort. Being aware of the fact that you will suffer knowledge/skill decay is the main part of the battle, choose what is important to you, assess the skill re-use you get in your normal work life and concentrate on those important skills you wish to retain but do not utilise day to day. Then there is the organisation’s responsibility to ensure your skills are maintained. From the factors above, it is clear that if you try a one-size-fits-all approach you will not be successful in all cases; like any learning experience you should utilise a variety of reinforcement methods based on the actual skill decay. Experiential learning, relevance of knowledge/skill and skills maintenance programs appears to be the best combination. The greater the distance of time you are from the acquisition of a skill the greater will be the skill decay. The amount of skill decay will depend on the task, how often it is used, how it was taught and the motivation of the individual. There is a two way contract between the organisation and the individual to maintain the learnt knowledge/skills for the betterment of both. This is a complicated issue and too often not seen as part of an overall learning package. Many hours of effort go into the initial course but like a good vaccination it is a waste of time without a booster. Neil Bibby is Managing Director of Vector Command. He was Chief Executive Officer of the Country Fire Authority between 2002 and 2009.